Friday, December 25, 1959, 10 PM EST on CBS. Yes, that’s right, we’ve skipped all the way to Christmas, because last Friday — i.e. December 18, 1959 — The Twilight Zone was pre-empted. Press release follows. “Iran: Brittle Ally,” an hour-long television portrait of the oil rich U.S. ally which shares a 2,000-mile common border with the Soviet Union, will be the third program in the “CBS REPORTS” series on Friday, Dec. 18, 10:00–11:00 p.m. The program will be presented just four days after President Eisenhower visits Iran on his tour of Asian and Middle Eastern nations, and will include scenes of his visit. CBS News Correspondents Edward R. Murrow and Winston Burdett will narrate the special filmed program. They will interview Shah Mohammed Reza Pahlevi, as well as other Iranians from various walks of life, and American citizens living and working in Iran. Among those on the program will be Abol Hassan Ebtehaj, until recently Managing Director of Iran’s Plan Organization; David E. Lilienthal, former Director of the Tennessee Valley Authority, who is currently supervising the building of a similar project for the Iranian government in Kuzistan; and Col. William A. Kuhn, Deputy Chief of the U. S. Mission to Iran. Iran, historically known as Persia, is a constitutional monarchy and has been ruled by kings for 2500 years, longer than any other country in the world. Geological surveys indicate that the country fairly floats in oil. The huge refinery at Abadan is the world’s largest, with a daily production capacity of 410,000 barrels. On the Dec. 18 program, viewers will see phases of the oil industry at Abadan as well as scenes of Iran’s two next best-known world export industries, the production of caviar (from the Caspian Sea) and the weaving of (Persian) carpets. This program sounds like an admirable and surely expensive piece of work by CBS News, so I don’t begrudge it pre-empting the Twilight Zone. As far as I can tell, Iran: Brittle Ally is no longer extant (though a transcript survives). What does it say about our culture that 60 years later, The Twilight Zone is available in pristine condition for anyone to watch, whereas Edward R. Murrow’s interview with the Shah of Iran (of “actual history” fame) has apparently been lost or destroyed? Now back to our regularly scheduled Twilight. Anyway, it’s not a very good episode, but it’s an interesting spin on the magic-man Santa Claus motif, since it’s about dread of the impulse to abuse him. The lead character (“Mr. Renard,” eh?) represents Rod telling himself: “aw, even if there were a magic man, I’m sure I’d still manage to louse it all up, what with my venal nature.” As usual — as always — the essential conflict is just one fantasy identity chasing another. This time it’s the lowlife and the kindly old man. The test pilot and the nerdy little dork and the ordinary suit weren’t invited to this one, but there’s always next week. It’s starting to be almost embarrassing how they all happen to be 36. Frankly the whole premise is vague. Is it just that the guy magically knows what people will need? Or is it that he magically arranges good fortune for them, and these props are obscurely the instrument of it? The baseball player at the beginning doesn’t actually need a ticket to Scranton in any magical way; once he has a reason, he can just buy one. What he needs is the job itself, which is offered to him out of the blue immediately after encountering the old man. So did the old man do it, or not? Seems like our writer didn’t really care about the distinction; the important thing is just that this old man is a magic-man Santa Claus. That much comes through crystal clear. The real underlying premise is just the standard fantasy that life is a story and all our uncertainties are just uncertainties about the text. “Oh I see, then I get hired to coach that team in Scranton. Well that answers that!” This fantasy has such deep roots that it hardly even feels like a fantasy. We can play along without it being spelled out coherently. Rod is admirably blasé about rules; rules would just weigh these dreams down. When he does give rules, they usually feel inserted, disingenuous. “The things you need you need just once.” Oh? This story had the rare distinction of having already been adapted for TV, on ABC’s Tales of Tomorrow in 1952. 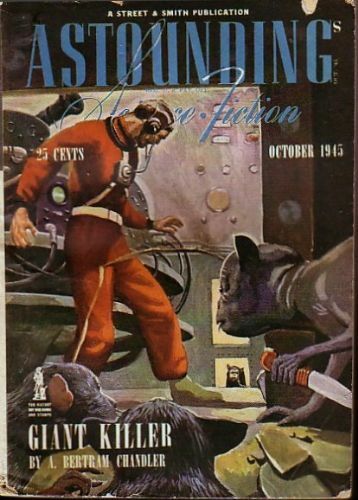 That version is almost entirely faithful to the original story (from the October 1945 issue of Astounding Science Fiction) — except for a moral hedge at the very end. The original story has actual science fiction in it, and also sort of a point to make about ethics: that perfect knowledge is incompatible with standard morality. 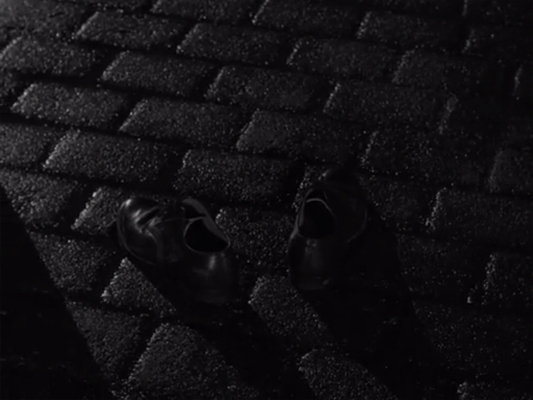 Whereas the Twilight Zone version, as usual, strips the scenario down to its simplest paper-doll dream-image, and then invests it with vague psychological angst. It’s like the stories are adapted for the show by being read to a nervous child and then a script is written based on the child’s drawing. More or less, I think, this is indeed how it works. The child’s name is Rod Serling, and the drawing is in his head. We think of cultural material as always being siphoned upward, from a state of “folk” where it’s born wild, toward increasingly self-aware sophistication. It’s good to remember that sometimes it also goes the other way. Rod Serling is sort of like the Brothers Grimm, but instead of culling his stories up from the dreamlife of the illiterate commoners, he’s plucking them from the literate world and melting them back down toward unselfconscious fable. Anyway, the Tales of Tomorrow version is pretty good. It’s certainly interesting viewing as an example of relatively ambitious live TV from 1952; the three-camera technique is already impressive in its way, but the impression is strong that TV still saw itself as “visible radio.” That’s an antiquated point of view but I found it can also be stimulating — how luxurious it is, after all, to be able to see all these people! Van Cleave’s music isn’t in the same league as his score for Perchance to Dream, but it’s not bad — the “magic” arpeggio figure is nice, and I respect how he manages to apply it constantly without wearing it out. Good use of organ, too. I’m not sure “God Rest Ye Merry Gentlemen” is so tremendously apt that it needs to be in every scene; I guess Rod must have said “play up the Christmas-y aspect of the story, ’cause it’s airing on Christmas.” And since there isn’t really any Christmas-y aspect of the story, Van Cleave must have felt it was incumbent on him to hit it pretty hard. Recorded December 9, 1959, 9AM – 12:15PM, Goldwyn Studios.